China has experienced unprecedented urbanization over the past 30 years, leading to rapid mobilization and a seven fold increase in the nation’s urban area. According to the Ministry of Housing’s China Urban Construction Statistical Yearbook, China’s built urban area grew from 7,438 square kilometers (2,872 square miles) in 1987 to 49,773 square kilometers (19,217 square miles) by 2014, a 570 percent increase. With the vast expansion of urban areas, the average travel distance for city residents rose significantly, triggering a higher demand for vehicle use. As a result, private car registration soared, reaching an annual growth rate over 20 percent, from 2004 to 2014 (see Figure 1). 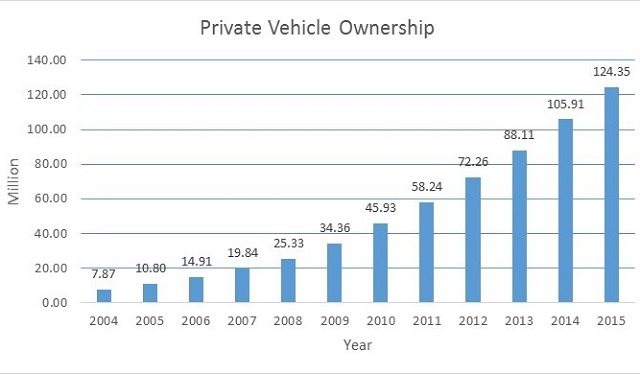 In 2015, private vehicle ownership reached an all-time high, with 124 million cars in China and 5.6 million in Beijing alone. The increasing rate of cars on the road has contributed to worsening traffic congestion, which has been a big challenge for local governments. To mitigate congestion, the government turned to creating new roads, incentive programs and car-sharing. They soon learned, however, that the pace of constructing new infrastructure never catches up with vehicle growth—newly developed roadways induce more vehicle travel demand. Additionally, although vehicle registration lottery policies and license plate auction schemes aim to limit the growth of vehicle ownership, they stimulate existing owners’ aspiration to use their vehicles more frequently. Furthermore, internet-hired taxi companies, like Uber and Didi, which provide subsidies and discounts for drivers and passengers, respectively, bring more spare and un-used cars on the road. To find a new solution to China’s persistent congestion challenges, the government is starting to prioritize moving people, instead of moving individual vehicles. In order to lessen dependence on private vehicles, address the needs of the people and create a more efficient mobility system, Chinese transport experts, innovators and governmental officials are turning to transport demand management (TDM). TDM focuses on reducing travel demand by changing people’s travel behavior, encouraging a modal shift away from personal motorized transport and unlocking additional capacity from the existing networks. Due to TMD’s importance for the future of sustainable mobility, it was one of the focal points at the third World Metropolitan Transport Development Forum (WMTD). On October 24 – 25, over 500 participants gathered in Beijing to discuss challenges and solutions for sustainable transport development. 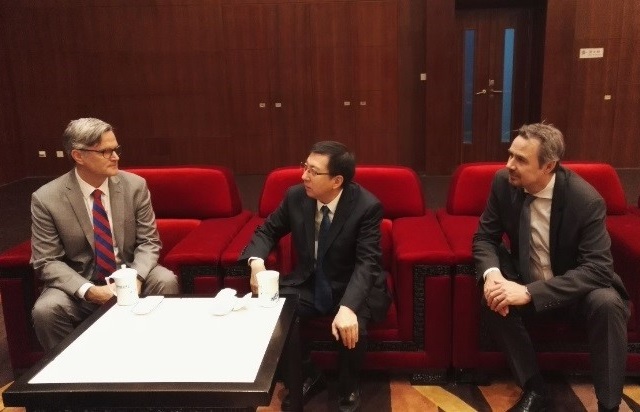 Beijing Municipal Commission of Transport (BMCT), Beijing Transport Institute (BTI) and WRI China co-organized the forum, striving to encourage city leaders and transport professionals to address challenges in urban mobility. During the forum, Vice Mayor of Beijing Jiandong Zhang noted that congestion is always ranked the number one transport issue on the government’s agenda. In response, decision makers and professionals from around the world highlighted TDM as one of the most efficient solutions to mitigate traffic congestion. Jorge Macias, Director of Urban Development at WRI Mexico, explained that TDM is not intended to limit mobility, and that TDM policies without mobility is similar to exercising without a diet. TDM cannot only reduce the need for motorized transport, especially in urban areas, but it can also create better use of existing transport facilities. The incentive of TDM measures provides a sustainable solution for urban planners to rejuvenate existing public spaces for more efficient mobility use. Upon acknowledging that expanding the road network is not the best method to decrease congestion, the Chinese government set new goals to 1) adjust the structure of transport and travel mode share by prioritizing public transport development and non-motorized transport systems; 2) enhance more economic incentives to manage travel demand and limit the use of private vehicles. 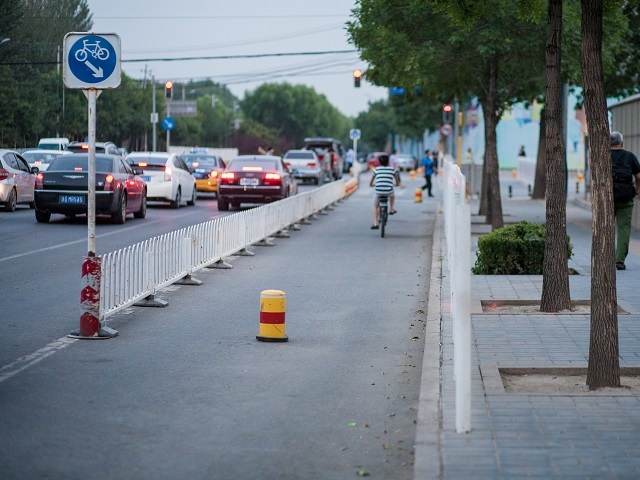 WRI China is working with Beijing Municipal Commission of Transport and Ministry of Transport to promote a package of preferred TDM measures, with congestion charge as a core policy, to alleviate traffic congestion and promote low-carbon and sustainable mobility. The Ministry of Transport‘s (MOT) 13th Five Year Plan for Urban Public Transport Development is the first time that congestion charge is identified as a key measure to ease urban traffic congestion. Managing traffic congestion is a systematic project that depends on integrated measures and coordinated government frameworks. The government’s TDM goals aim to enhance urban transport systems with less congestion and more efficient mobility. As the long-term benefits of policies, like a vehicle registration lottery, are called into question, the Beijing government is considering the introduction of more market-based mechanisms, like congestion charge and differential parking fees for administrate vehicles, to help meet the government’s goals.